A friend of mine recently told me he’d purchased a chainsaw at a price that I found hard to believe. Not only that, he claimed that this affordable saw actually did a good job! I had my doubts, but I was willing to hear him out. I’m not exactly a glass is half empty kind of guy, but in my experience when something sounds too good to be true it normally is. Besides, when we had this conversation he’d only had his chainsaw for about a week. Well, he’s now had that chainsaw for more than six months and it’s still going strong. 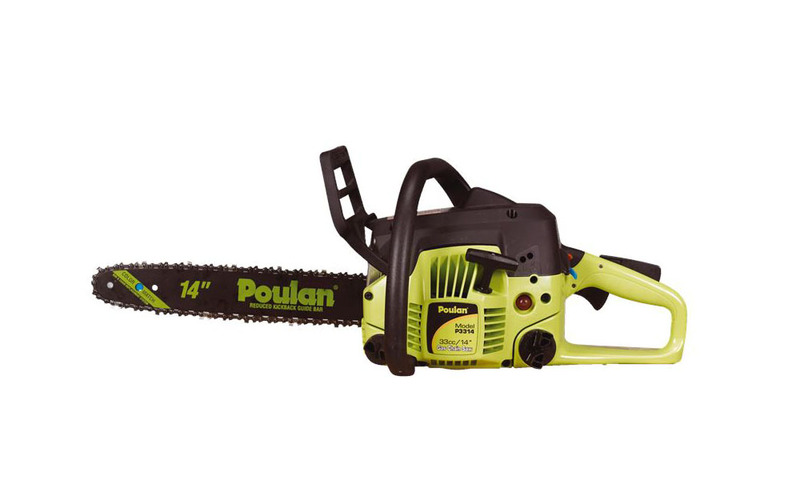 My friend’s chainsaw was manufactured by the well-known outdoor power tools manufacturer Poulan, and while I’m not sure what particular model he was using it does look similar to the Poulan P3314. This is an affordable and versatile chainsaw with a solid reputation. You can purchase this chainsaw for well under $200. The blade on the Poulan P3314 isn’t the largest by any means, but at 14 inches you can still cut through tree branches that are up to 28 inches in diameter without much of a problem. For most backyard users that’s more than enough for the tasks they’ll normally tackle. If you do require a saw with a little more capability there are more expensive models to choose from and we review many of them on this site. This chainsaw is really meant as an affordable compromise between affordability and capability. An effective air filter system is important when you’re using any type of power tool with an internal combustion engine; with that in mind this Poulan model has been designed with a super clean air filtration system that can effectively extend the life of your air filter. If you can minimize the amount of maintenance you have to perform on a regular basis you can extend the life of your chainsaw as well. This clean air filter can’t accomplish all this on its own, of course, but it is an important cog in your machine’s mechanical infrastructure. As we’ve already mentioned this chainsaw has a blade bar length of 14 inches. That doesn’t make it the smallest on the market, but there are models with a lot longer blades that can cut through a lot thicker branches. Yes, it is to be expected that you wouldn’t have a long blade on a less expensive chainsaw, but there are chainsaws that are much more expensive with longer blade bars so this is a bit of a disappointment. The P3314 has a built-in primer bulb that makes sure that the chainsaw starts quickly and with minimal effort. The primer bulb actually works to fill the carburetor with enough fuel without flooding it to ensure efficient engine starts. It might not start on the first pull every time, but it will start just about every time. There’s nothing more frustrating than a power tool that simply won’t start, so this is a big comfort. A chainsaw can’t be effective if there isn’t enough oil on the blade – after a while you run the risk of damaging your blade. The oil provides the necessary lubrication needed to keep the chainsaw operating smoothly and ensures it can cut through wood when you need it. This chainsaw includes an automatic chain oiler which definitely makes your life easier. As long as you’ve filled it with oil, the automatic oiling mechanism will take care of the rest. A heavy chainsaw will start to wear on you after a while. After all, no matter how ergonomically it’s designed, it’s still extra weight that you have to hold in your hand. That’s why it’s comforting to know that this one weighs about 16 pounds. That’s relatively light for a gas-powered chainsaw and it’s light enough that you should be able to continue working until the job’s done. I’m not suggesting that you shouldn’t take any rests while you’re working, but that’s up to you. No matter how careful you are, the potential does exist that you may inadvertently cut into a knot in a branch that will cause the chainsaw to kickback, which can be potentially dangerous to the user. This Poulan chainsaw is designed with a chainsaw brake that’s more sensitive than most other similar products. Safety isn’t something you should ever take for granted; knowing that this system is in place will allow you to continue your cutting project comfortable in the knowledge that you’re protected against a dangerous kickback. In my mind a warranty is always a good indication of how confident a manufacturer is in their product. Disappointingly, Poulan only provides a one-year warranty for this chainsaw. That doesn’t even meet the normal industry minimum of about two years and is well below some of the better products on the market which have warranties up to five years. I love saving money as much as the next guy, but I still expect a decent warranty on any power tool; this one, unfortunately, doesn’t qualify. While it’s nice to know this chainsaw starts fairly reliably, it unfortunately has somewhat of a reputation for stalling a little bit too often. There’s nothing more frustrating than being halfway through a job only to have your tool stall on you. If this happens halfway through a cut you might even find the chainsaw will become lodged in a log, making it difficult to remove. There are a lot of minor issues I can deal with, but a machine that stalls constantly isn’t one of them. The Poulan P3314 does have a number of fans, but I found there were too many question marks surrounding this chainsaw. The one-year warranty is a major concern, and when you combine that with the fact that it has a reputation for continuously stalling it’s hard to overlook these defects. For these reasons this particular chainsaw is one I would suggest taking a pass on.